“Content is king” has become a commonplace phrase to Tweet, throw out in conversation, or tape above your desk. It’s true that content has become incredibly important for today’s businesses, something Bill Gates predicted in 1996. It’s obvious people are wondering what content marketing is and how they can use it to grow their businesses. What’s all the fuss about? We’ll tell you and share some ways to make content marketing in WordPress easier and more successful with five steps. First, what is content marketing and why does it matter? Content marketing is the act of using online content to meet marketing goals. This involves creating and distributing content that will attract and retain an online audience. Content is anything that sends a message to people. It can be emails, social media posts, blog posts, product pages, etc. The goal of content marketing isn’t only to have any ole audience, but one that is engaged with a brand and will drive profit. Content marketing is great because it’s accessible to businesses and organizations of all sizes. It isn’t limited to those with the right budget. It’s difficult to focus on achieving all of these benefits at once, especially for small businesses with few employees. Luckily, with content marketing, many of the benefits spillover into one another. For example, improved SEO results in more site traffic. Score! 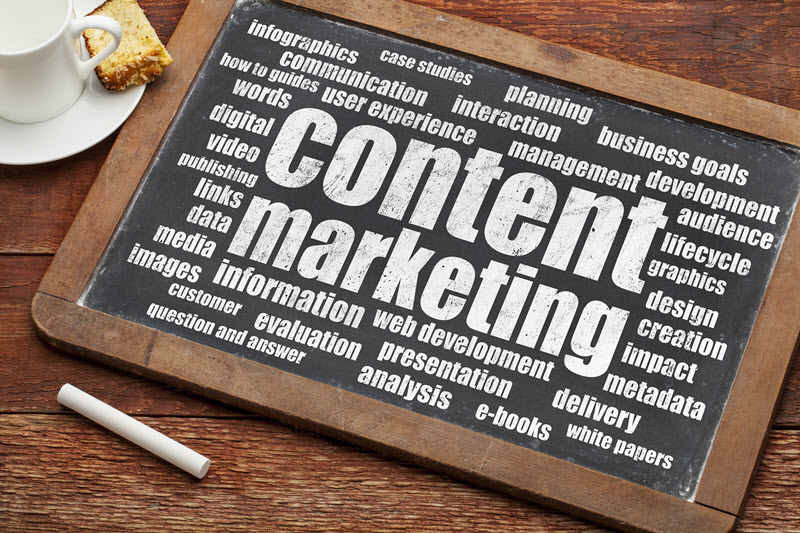 If you’re new to content marketing, don’t get bogged down in the intricacies. It’s important to set achievable content marketing goals. Start by setting out to do something. This could be as basic as starting a newsletter, or something more specific like increasing social media shares. Maybe you want to build an email list. There are many possibilities. All of these and more can be achieved with content marketing tools in WordPress, so start working toward your website goals! There are many steps to the content marketing process. Here we break down each step and explain how to integrate the basics of content marketing in your WordPress website. Included in each step are plugins that make content marketing more manageable and less frustrating. All plugins listed are affordable solutions, so you can no longer use that excuse of marketing being too expensive to do. Remember, content marketing, when done right, is fairly cheap and produces amazing results, so there’s really no excuse to not try at least one of these steps. This list is organized by different focuses in the content marketing process, so feel free to scroll down to whatever area you need help with. Enjoy! The first step to any content marketing endeavor is planning. Content marketing is not something business professionals should go into blindly. It doesn’t mean you simply write something and release it into internet-land. Succeeding in content marketing requires strategy and planning. Organization is key to many areas of business and content marketing is no different in this aspect. The first step to content marketing is to create a simple editorial calendar. With a quality editorial calendar, content marketers can organize a content strategy. It should include scheduled blog posts to be released on certain days. More advanced editorial calendars can include content authors, categories, social promotion, content type, and more. Just make sure it’s organized and can be adapted over time. With the help of the Editorial Calendar plugin, businesses can organize upcoming posts. It creates a big picture view of everything in the works, so it’s easy to plan a content strategy in advance to maximize results. You can see the status of all your posts in one place, making organizing a lot easier. This plugin includes the ability to drag and drop posts, edit scheduled posts right in the calendar, and manage posts from multiple authors. 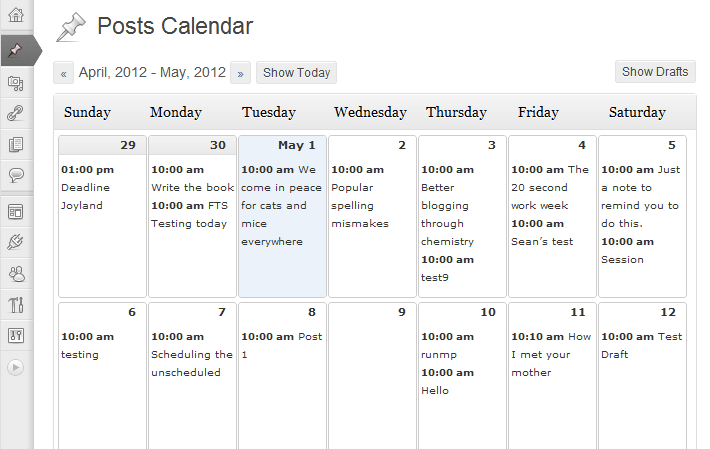 You can create a special calendar for each custom post type, for example, podcasts. If you’re looking for something a bit more advanced, check out Edit Flow. Not only does this plugin come with an editorial calendar, it has a lot of other helpful features. Users can define custom statuses for posts, such as “Needs Edit,” “Ready to Publish,” etc. These are a lot more descriptive than the default “draft” and can help keep multiple team members on track. In addition users can comment on specific posts in private, receive notifications on content their following, and organize users by department or function. There’s even an area to organize a content budget! Both tools lessen the time it takes to plan, organize, and publish content. Even fairly simple tools like these can produce dramatic results in terms of helping manage content marketing workload. If you’re looking for a more advanced content strategy tool, check out CoSchedule. Add CoSchedule right to your WordPress dashboard with their handy plugin. It also connects to Evernote and Google Docs, a plus if you currently use or plan on using either to organize unpublished content. This plugin is many things packed into one. It’s an editorial calendar with social media post scheduling, workflow management, and promotion planning. Schedule social media from the WordPress dashboard. You can view top posts, social sharing analytics, and communicate with team members. To succeed in content marketing, you need–you guessed it–content. Not just any content will do. It needs to be engaging and easy for readers to digest. Content that immediately bores readers or doesn’t fulfill their needs (for example, answering a specific question) will not prove successful in content marketing. Think about it this way: it’s a lot more difficult to market a bad product than a product that excites people. Your goal is to create something that engages people. A good rule of thumb is to keep one piece of content to one subject. Pick something potential customers might be interested in and stick to it. Jumping between multiple subjects has the potential of losing readers. Give the reader something useful. Provide actionable content, meaning the reader can take the information and apply it. Titles like “5 Ways to do XYZ” will be worth reading because they offer useful information. Last but not least, make sure the content is something readers enjoy reading. Blog posts with images are a lot more appealing to readers, so throw in a couple relevant ones. Use short paragraphs instead of long ones to make information easier to read. The CM Curated List Manager helps create curated content with links organized into categories and sub-categories. Lists can be a recommended content list, favorite lists, or a professional knowledge base. A custom curated list is a useful resource for readers and the features of this plugin (tooltip descriptions, category organization, checkboxes, and more) help create engaging content. Another way to create engaging content is to add a fun quiz to your WordPress site. Quizzes are helpful for getting more social shares, as quizzes make up 75% of overall traffic from social shares. To add a quiz to a WordPress post, simply sign up for Buzzfeed and choose from four quiz types: personality, trivia, checklist, or poll. Add questions with images or GIFs and answers. Get creative and make the questions and answers entertaining! At the end, you’ll find a code to embed the quiz on your WordPress site. Then, you can post the quiz on social media and see how much traffic rolls in. Sounds easy, right? You’ve got awesome content. You want people to read it, right? This is where email marketing and social media come in. Through email marketing, business can send content directly to those who have already expressed interest or completed a purchase. Before you start sending out content via email, you must first build an email list. This requires having a message that inspires people to sign-up, also known as a call-to-action (CTA). A popup or subscription box with a strong CTA can work wonders. One effective way to gather email addresses is to create irresistible content readers must subscribe to access. For this strategy to succeed, the content must be attractive, actionable, and fulfill a need of the target audience. OptinMonster helps grow an email list and gain subscribers with high-converting popup forms. This plugin comes with an easy form builder to create popups, header and footer bars, sidebar forms, in-post forms, mobile-specific forms, and more. This service integrates with popular email marketing services like MailChimp, ConstantContact, and more. Success messages, Exit Intent™ technology, and timed popups are all helpful features for converting email subscribers. Note: you must have an account with OptinMonster to use this plugin. SumoMe addresses a few areas of content marketing: email marketing, social sharing, and tracking analytics data. Here’s how. SumoMe comes with an email list builder, call-to-actions, and a scroll-triggered email pop-up feature. It provides Google Analytics integration to view data right in your dashboard. It also allows users to simply click on post images or post excerpts to tweet. CM PopUP Banners plugin isn’t just for building an email list, although it can be used for that. Popups can be used in many different ways to enhance a content marketing strategy. They can direct site visitors to certain blog posts, product pages, promotional pages, etc. They can also be used to gain email list subscribers, as we’ve already seen in a couple plugins. Popups created using the CM Popup Banners plugin are mobile friendly, can be targeted to certain pages or page categories, and scheduled for certain time periods. WordPress users can create eye-catching popups with images and custom branding capabilities. A plus? The pro version of this plugin also comes with statistics, so content marketers can analyze how well popups are generating leads. Social media has become a huge presence in the average customer’s life. It’s not only used to share personal status updates, it can be used to increase brand awareness, an essential piece of growing a website. Building an audience on social networking sites like Facebook, LinkedIn, and Twitter can help direct traffic to your website and increase website conversions. You can also display Facebook or Twitter feeds using a free plugin like Easy Twitter Feed Widget to encourage site visitors to follow content updates. Content marketers can reach out to key influencers in their niche to help promote content. If you cited an influencer in your content, send them a message via social media and see if they’ll share the post for their followers to see. An effective social media strategy also involves making it easy for readers to share content from your WordPress site to social media. This increases the reach of your content and can help breathe new life into old content. AddToAny Share Buttons allows readers to share content to Facebook, Twitter, Pinterest, Google, WhatsApp, LinkedIn, Tumblr, Reddit, and over 100 more sharing and social media sites & apps. There’s also an email sharing option. This plugin creates floating share buttons that are mobile-friendly, show share counts, and are customizable. WordPress users can place them before or after content, in a widget, or as a vertical or horizontal bar. They’re integrated with Google Analytics to gather sharing analytics. Social Warfare is a more advanced tool to increase social shares and drive website traffic. In its simplest form, Social Warfare adds attractive, mobile-friendly share buttons for 13 different platforms. These buttons are customizable to match website branding and include share counts (including a minimum number). 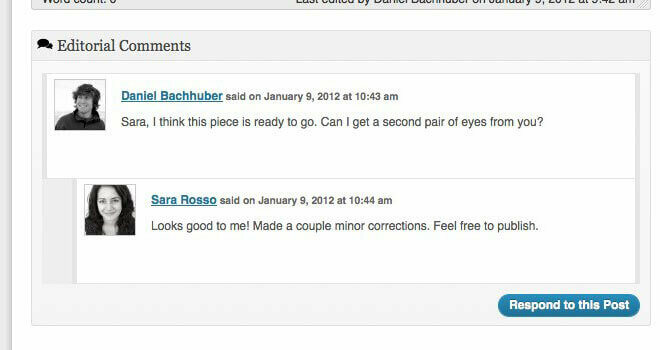 WordPress users can customize tweets populated when a reader goes to share a post. They can create tweetable quotes that make social sharing easy. The many features of Social Warfare make it easier for businesses to increase presence on social media. No content marketing strategy is complete without analysis. This is an easy step to skip, but one that is extremely important. How do you know if your content marketing strategy is working if you aren’t looking at the data? Take those benefits of content marketing we discussed in the beginning and see if they’re coming true. Is your website gathering more traffic? Are conversions increasing? Don’t expect magical results instantly, but spend some time every few weeks making sure you’re going in the right direction toward achieving your content marketing goals. If the analytics data shows you are not, it’s time to try something different. Create an Excel sheet to organize the most important metrics such as traffic, page views, and bounce rate (% of visitors who go to your site and immediately navigate away). The metrics you choose to record will depend on your specific content marketing goals. There are several plugins that automatically gather data and make it easy to understand the success of your content marketing efforts. Both plugins use Google Analytics, an extremely popular tool that tracks copious amounts of data related to website traffic, online store conversion rate, and social media. 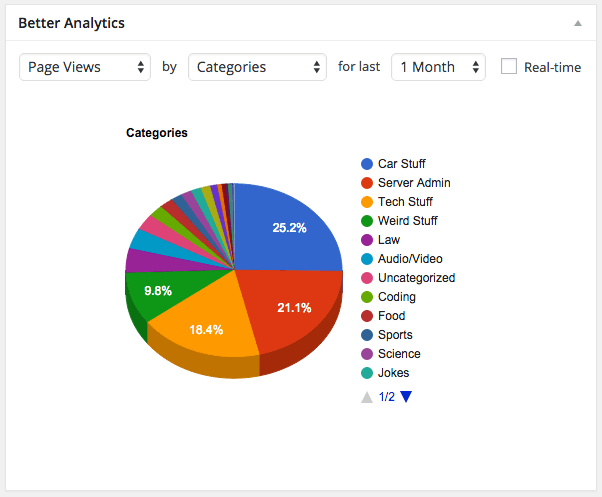 Google Analytics metrics create a picture that can be used to gain insight into how content marketing can be improved. If you’re looking for a simple Google Analytics reporting plugin, this may be it. It adds real-time analytics to your WordPress dashboard, including number of visitors, acquisition channels, and traffic source details. Track individual posts or pages and add analytics widgets to posts or pages. There is also the ability to sample page speed to get an idea of how fast pages are loading. Faster=better in a reader’s eyes. Better Google Analytics does way more than just show site views. It tracks virtually anything, right from the dashboard. This includes heat maps, user engagement, page scroll percentage, YouTube views, Ad clicks, file downloads, and more. View content popularity by category, display popular posts based on analytics, and understand posts from which year are the most popular. These metrics and more give detailed information on where your content strategy stands. Now you have it–a step-by-step guide to the basics of content marketing and WordPress and plugins that will help make your content marketing dreams come true. What are your favorite content marketing plugins? Did we miss any you think are essential? Follow us on Twitter to start a conversation.